冯琳, 顾惠敏, 叶祖鹏, 魏广东, 黄国平, 白旭明, 韩伟, 候银莹, 陈波浪. 不同基因型棉花根系对局部供磷的响应特征[J]. 植物营养与肥料学报, 2018, 24(5): 1303-1312. FENG Lin, GU Hui-min, YE Zu-peng, WEI Guang-dong, HUANG Guo-ping, BAI Xu-ming, HAN Wei, HOU Yin-ying, CHEN Bo-lang. Root response of different cotton genotypes to local phosphorus supply[J]. Journal of Plant Nutrition and Fertilizers, 2018, 24(5): 1303-1312. Abstract: 【Objectives】 In soil, nutrients are distributed in a heterogeneous or patchy manner. It is of great significance to explore response of roots of different cotton genotypes to the heterogeneity of nutrients, which is of great importance to improve phosphorus (P) utilization efficiency of cotton. 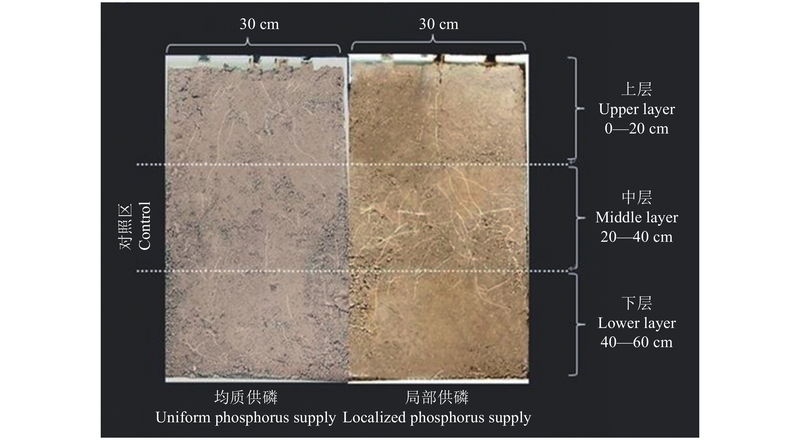 【Methods】 In this soil culture experiment, two kinds of phosphorus supply methods are used: uniform phosphorus supply and local phosphorus supply. The root box is divided into three layers from top to bottom (upper layer 0–20 cm, middle layer 20–40 cm, lower layer 40–60 cm). The amount of phosphorus fertilizer in each layer of the root box is P2O5 100 mg/kg under the uniform phosphorus supply. Phosphorus fertilizer dosage is P2O5 300 mg/kg under local phosphorus supply, all concentrated in the middle layer (20–40 cm), and no phosphorus is applied to the upper and lower layers. Nitrogen and potassium fertilizers are uniformly added to each layer of the root box according to N 150 mg/kg and K2O 5 mg/kg under both phosphorus supply methods (calculated at 75 kg/hm2 of Xinjiang potassium fertilizer), a soil box experiment simulated the localized supplies of P (20–40 cm) is conducted to study root response to local P supply in two cotton genotypes. 【Results】 Local P supply significantly modified root morphological parameters in two cotton genotypes. Total root length, root surface, root volume, specific root length, fine root length of low phosphorus efficiency genotype (XLZ13) and high phosphorus efficiency genotype (XLZ19) in the local P supply treatment were increased by 38.0%, 41.9%, 97.6%, 27.3%, 35.9% and 34.5%, 21.7%, 39.0%, 22.5% and 42.8%, respectively. There were significant differences in root parameters of the two cotton genotypes with the local P supply. 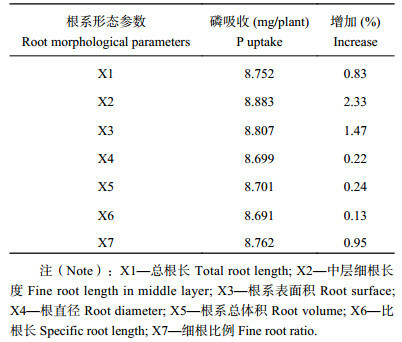 The total root length, root surface, root volume, specific root length and fine root length in middle layer of the high phosphorus efficiency genotype (XLZ19) were 1.23, 1.31, 1.73, 1.07 and 1.30-folds of those of the low phosphorus efficiency genotype (XLZ13). The results of the principal component analysis showed that P supply could affect the plasticity of cotton root system, while cotton genotype could modify basic structure of root system. 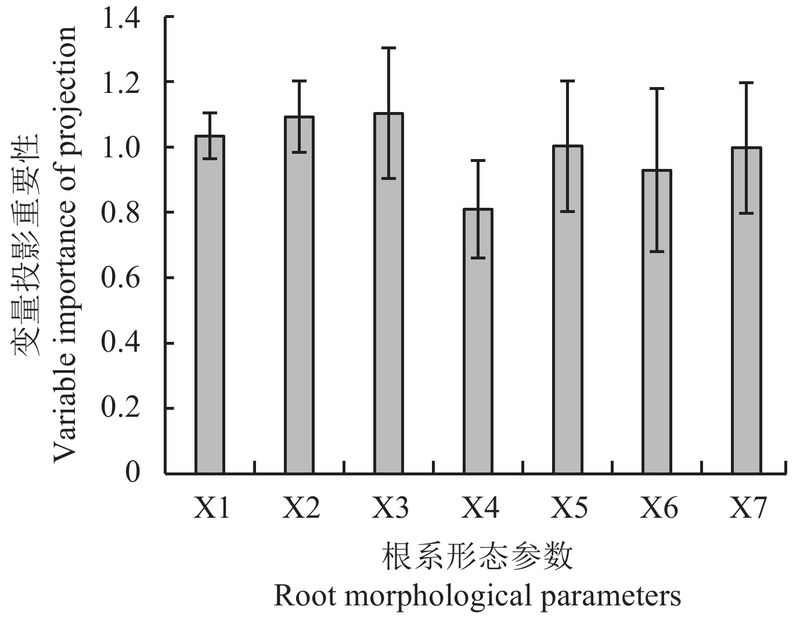 Partial least squares regressive analysis showed that the VIP values of total root length, fine root (0–0.4 mm) length in middle layer (20–40 cm), root surface and root volume were larger than 1, which played important role in aboveground phosphorus uptake. 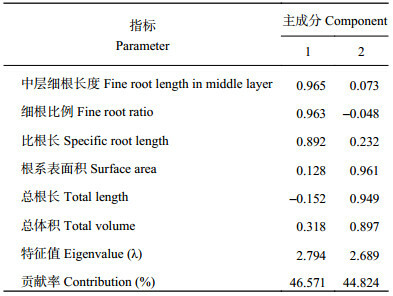 The fine root (0–0.4 mm) length in middle layer (20–40 cm) made greater contribution to P uptake of cotton in soil, i.e, the increase of 10% of fine root (0–0.4 mm) length in middle layer (20–40 cm) could improve 2.33% of the aboveground phosphorus uptake. 【Conclusions】 The high phosphorus efficiency genotype cotton has higher environmental adaptability in the local P supply. For efficient and inefficient genotypes, the local P supply should be adopted to optimize root distribution and growth, and to improve cotton’s ability to obtain heterogeneous phosphorus nutrients so as to exert the maximum biological potential of cotton, improve nutrient utilization, reduce fertilizer dosage, and protect ecological environment. 注（Note）：数值后不同小写字母代表同一参数下种质间在 5% 水平差异显著 Data followed by different letters show significantly different at the 5% probability level; *—P < 0.05; **— P < 0.01; ***— P < 0.001. 注（Note）：X1—总根长 Total root length; X2—中层细根长度 Fine root length in middle layer; X3—根系表面积 Root surface; X4—根直径 Root diameter; X5—根系总体积 Root volume; X6—比根长 Specific root length; X7—细根比例 Fine root ratio. Hodge A. The plastic plant: root responses to heterogeneous supplies of nutrients[J]. New Phytologist, 2010, 162(1): 9–24. Rabbi S M F, Guppy C N, Tighe M K, et al. Root architectural responses of wheat cultivars to localised phosphorus application are phenotypically similar[J]. Journal of Plant Nutrition and Soil Science, 2017, 180(2): 1–9. Hodge A, Berta G, Doussan C, et al. Plant root growth, architecture and function[J]. Plant and Soil, 2009, 321(1/2): 153–187. 张田, 许浩, 茹淑华, 苏德纯. 不同有机肥中磷在土壤剖面中累积迁移特征与有效性差异[J]. 环境科学, 2017, (12): 1–14. 沈浦. 长期施肥下典型农田土壤有效磷的演变特征及机制[D]. 北京: 中国农业科学院博士学位论文, 2014. Shen P. Evolution characteristics and mechanisms of soil available phosphorus in typical croplands under long-term fertilization [D]. Beijing: PhD Dissertation of Chinese Academy of Agricultural Science, 2014. 何勇, 廖红, 严小龙. 局部供磷条件下旱种水稻根形态构型的适应性变化[A]. 第八届全国青年土壤暨第三届全国青年植物营养与肥料科学工作者学术讨论会组委会. 第八届全国青年土壤暨第三届全国青年植物营养与肥料科学工作者学术讨论会论文集[C]. 江苏南京: 中国土壤学会, 2002. He Y, Liao H, Yan X L. Adaptive changes of root morphology and structure in dry rice under partial phosphorus supply [A]. The eighth national youth soil and third national youth plant nutrition and fertilizer science workers academic seminar organizing committee. The eighth national youth soil and third national youth plant nutrition and fertilizer science workers academic symposium proceedings [C]. Jiangsu Nanjing: Chinese Soil Society, 2002. 束良佐. 生长介质和局部供磷对白羽扇豆排根形成和柠檬酸分泌的影响[D]. 北京: 中国农业大学博士学位论文, 2005. Shu L Z. Effects of growth medium and localized phosphorus supply on cluster root formation and citrate exudation by lupinus albus [D]. Beijing: PhD Dissertation of China Agricultural University, 2005. 严小龙, 廖红, 戈振扬, 罗锡文. 植物根构型特性与磷吸收效率[J]. 植物学通报, 2000, 17(6): 511–519. 朱祝军, 孙羲, Sattelmacher B, Thoms K. 局部供磷对玉米根系生长、磷吸收速率的影响[J]. 植物生理学报, 1993, (3): 221–228. Zhu Z J, Sun X, Sattelmacher B, Thoms K. Effects of localized supply of phosphate on root growth and phosphate uptake rate in maize[J]. Acta Phytophysiologica Sinica, 1993, (3): 221–228. 姜益娟, 郑德明, 翟云龙. 不同灌溉方式的棉花根系在土壤中的分布特征[J]. 塔里木大学学报, 2008, 20(1): 1–5. 罗宏海, 朱建军, 夏徽, 等. 滴灌棉田根区水分对棉花根系生长及活力的影响[A]. 中国棉花杂志社. 中国棉花学会2006年年会暨第七次代表大会论文汇编[C]. 河北保定, 2006. 186–190. Luo H H, Zhu J J, Xia H, et al. Effect of water around root zone on dry mater production and water efficiency of cotton under-mulch-drip irrigation [A]. China Cotton Magazine House. Proceedings of the 2006 annual conference and the seventh congress of the China Cotton Society[C]. Hebei Baoding, 2006. 186–190. 陈波浪, 盛建东, 蒋平安, 等. 不同基因型棉花磷效率特征及其根系形态的差异[J]. 棉花学报, 2014, 26(6): 506–512. Chen B L, Sheng J D, Jiang P A, et al. Differences of phosphorus efficiency characteristics and root morphology between two cotton genotypes[J]. Cotton Science, 2014, 26(6): 506–512. 王靓, 盛建东, 陈波浪. 砂培条件下两种磷效率棉花根系形态及根际特征差异[J]. 中国土壤与肥料, 2016, (3): 67–72, 86. 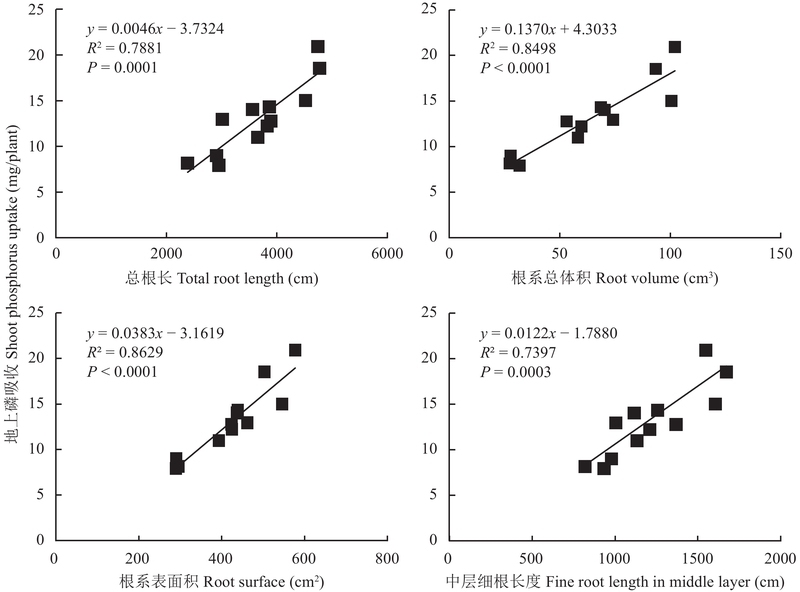 Wang L, Sheng J D, Chen B L. Effect of phosphorus levels on root morphology and rhizospheric characteristic between the different phosphorus efficiency cotton under sand culture condition[J]. Soil and Fertilizer Sciences in China, 2016, (3): 67–72, 86. 崔水利, 张炎, 王讲利, 姚家鹏. 施磷对棉花根系形态及其对磷吸收的影响[J]. 植物营养与肥料学报, 1997, 3(3): 249–254. 张敏, 盛建东, 白灯莎•买买提艾力, 冯固. 不同磷效率棉花根系形态和磷酸酶活性对供磷强度的响应[J]. 棉花学报, 2017, 29(3): 283–291. Zhang M, Sheng J D, Maimaitiaili B D S, Feng G. Response of root morphology and phosphatase activity of cotton to phosphorus supply[J]. Cotton Science, 2017, 29(3): 283–291. 罗佳, 候银莹, 程军回, 等. 低磷胁迫下不同磷效率基因型棉花的根系形态特征[J]. 中国农业科学, 2016, 49(12): 2280–2289. 谢志良, 田长彦, 卞卫国. 膜下滴灌水氮对棉花根系构型的影响[J]. 棉花学报, 2009, 21(6): 508–514. Xie Z L, Tian C Y, Bian W G. Effects of water and nitrogen on cotton root architecture under film drip irrigation[J]. Cotton Science, 2009, 21(6): 508–514. 李卫华. 棉花磷素高效利用品种筛选及机理的初步研究[D]. 乌鲁木齐: 新疆农业大学硕士学位论文, 2010. 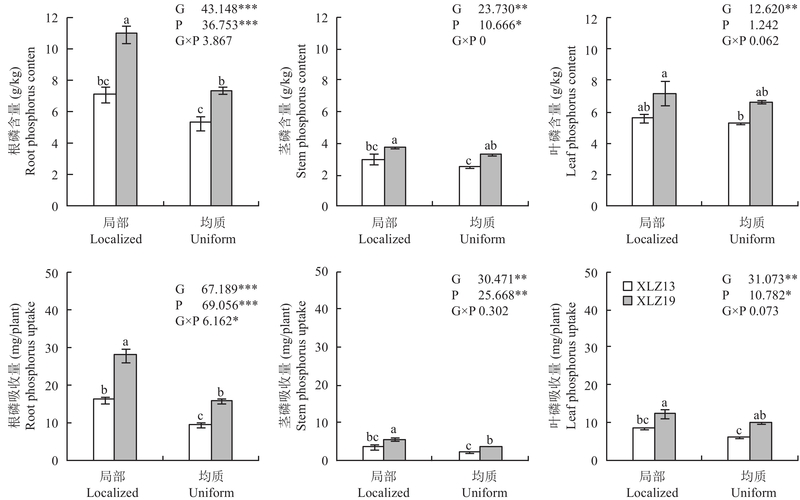 Li W H. Research on phosphorus efficient genotypes of cotton varieties screening and its mechanism [D].Urumqi: MS Thesis of Xinjiang Agricultural University, 2010. 鲍士旦. 土壤农化分析(第三版) [M]. 北京: 中国农业出版社, 2000. 30–109. Bao S D. Soil and agricultural chemistry analysis (3rd Edition) [M]. Beijing: China Agriculture Press, 2000. 30–109. 陈远学, 李汉邯, 周涛, 等. 施磷对间套作玉米叶面积指数、干物质积累分配及磷肥利用效率的影响[J]. 应用生态学报, 2013, 24(10): 2799–2806. Chen Y X, Li H H, Zhou T, et al. Effects of phosphorus fertilization on leaf area index, biomass accumulation and allocation and phosphorus use efficiency of intercropped maize[J]. Chinese Journal of Applied Ecology, 2013, 24(10): 2799–2806. 林雅茹, 唐宏亮, 申建波. 野生大豆根系形态对局部磷供应的响应及其对磷吸收的贡献[J]. 植物营养与肥料学报, 2013, 19(1): 158–165. Lin Y R, Tang H L, Shen J B. Effect of localized phosphorus supply on root morphological traits and their contribution to phosphorus uptake in wild soybean[J]. Plant Nutrition and Fertilizer Science, 2013, 19(1): 158–165. 陈哲, 伊霞, 陈范骏, 等. 玉米根系对局部氮磷供应响应的基因型差异[J]. 植物营养与肥料学报, 2017, 23(1): 83–90. Chen Z, Yi X, Chen F J, et al. Differential response of maize roots to heterogeneous local nitrogen and phosphorus supply and genotypic differences[J]. Journal of Plant Nutrition and Fertilizer, 2017, 23(1): 83–90. 廖晗茹, 李春杰, 李海港, 张福锁. 蚕豆增加直径为0.3～0.7 mm的中等根系根长适应土壤异质养分供应[J]. 植物营养与肥料学报, 2017, 23(1): 224–230. Lao H R, Li C J, Li H G, Zhang F S. Increment of root length of 0.3-0.7 mm in diameter in fababean contributes to the adaptation to heterogeneous soil nutrients supply[J]. Journal of Plant Nutrition and Fertilizer, 2017, 23(1): 224–230.